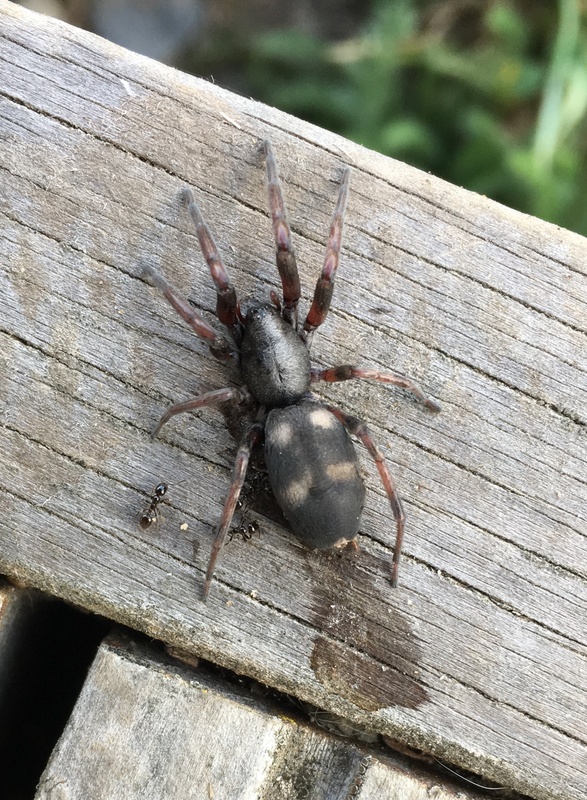 This morning I found this adult female white-tailed spider on my office deck. I don’t know what killed her—she’d dragged herself about 20 cm across the deck oozing hemolymph before succumbing to whatever it was—but by the time I saw her, the ants had found her. At first, they swarmed over her body, biting at her legs, tugging at hairs. I looked closely with a hand lens—they’d made not a mark on her exoskeleton. Melinda Mae was lucky whales’ skeletons are on the inside. Eventually, the ants stopped swarming, and I assumed they’d given up eating their ‘whale’. But a few hours later, I checked again and noticed an ant slip underneath the spider’s body. Another photograph revealed the spider was shrivelling. Some of the shrivelling would be from dehydration, for sure. But as I watched, I saw a steady stream of ants slipping in under the spider, then slipping out again. Something had punctured her, killing her. The ants had found the hole and were using it to access the soft bits inside. I expect these ants will accomplish their task much more quickly than Melinda Mae did, but then, they’re working as a team. So how do you eat a whale? Well, if it’s got an exoskeleton, the answer is, from the inside out. And if you want to finish before you grow old, get some friends to help.